Last winter when we bought our gravel bikes, Trent immediately started looking for races. 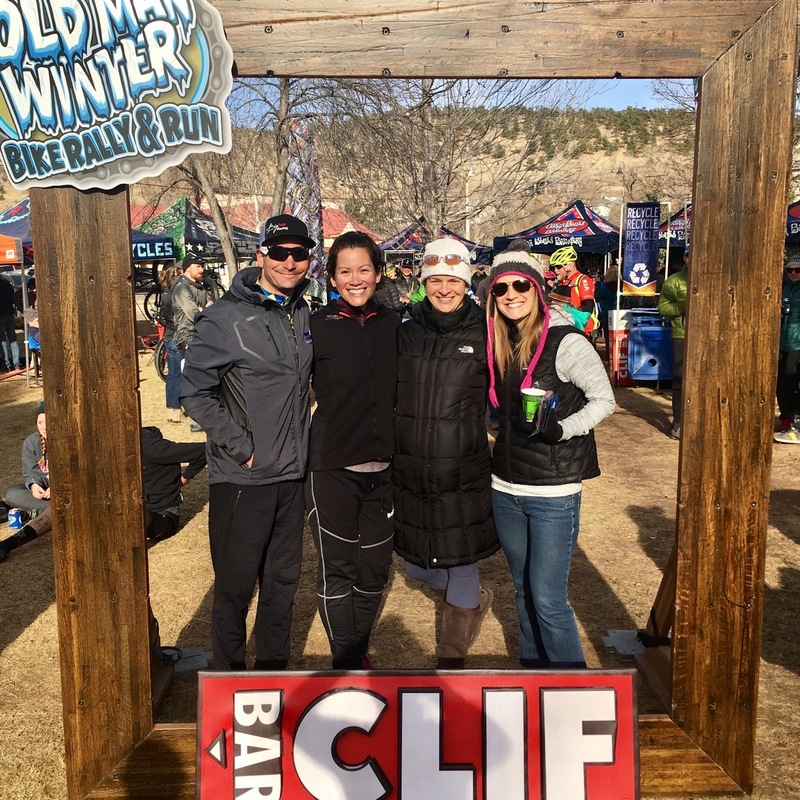 He found one in Lyons, CO – the Old Man Winter Rally, sponsored by his favorite brewery, Oskar Blues. The event celebrates winter with a gravel ride, a trail run, and beer and chili at the post-race party. We talked about traveling for the race from Texas last February, but didn’t end up going. Now that we live in the area, of course our first race here in Colorado had to be the Old Man Winter Rally! There are a few options at this race – a 100k gravel ride, a 50k gravel ride, a 5.8 mile trail run, or a combination of the 50k ride and the run. We opted for the run/ride combo. 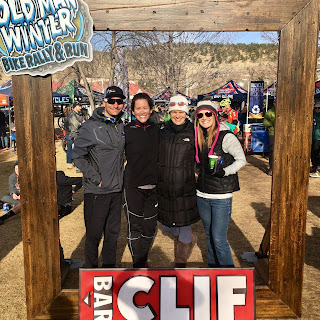 We drove up to Lyons for packet pickup at 8:30, met up with our BSR teammate Brian, watched the 100k riders head out for their race, and then prepared for the run which started at 10:30. I had come dressed for 35 degree temperatures in pants, a long sleeve shirt, gloves, and a beanie, but it was sunny, and after a 10-minute warmup, I was already hot. I changed into my cycling shorts and ran in them because they were the only shorts I had! The run was an out-and-back course on a combination of asphalt, gravel, and dirt trails. I didn’t have any expectations for pace, because the last month and a half of training at altitude has not been about pace, it has been about keeping my heart rate where it needs to be. In one of my first runs here, I ran with a friend for 6 “easy” miles at a 9:30ish pace and my heart rate was in zone 4. After that run, Emily cautioned me to slow down, be patient, and work on keeping my heart rate in zone 2 for easy runs. Last week, I ran the same 6-mile route on an easy run. I kept my heart rate in zone 1 and 2, and ended up running at a 9:45ish pace. Progress. Patience was paying off! For yesterday’s race, I ran at a “comfortably hard” tempo pace based on feel. When I glanced at my watch in the first half of the race, I saw that my heart rate was 165 (zone 4) and my pace was hovering just under 9 minutes/mile. I was okay with that, and aimed to hold the pace for the entire run. It wasn’t until the turnaround that I realized we’d been running uphill the whole way out. I watched my pace increase on the way back and aimed for negative splits. I was beyond excited to finish with a time that put my average pace at 8:04 (I think the course was short). Trent did well too. Even stopping during the run to pick up a snowflake – there were Styrofoam snowflakes scattered throughout all the courses, that if you brought one back, you’d get a prize – Trent ended up running at an average 6:40 pace. So awesome! But we had no time to celebrate because we had to hurry and change and get our bikes out of the car and ready to ride. Just a guy and his snowflake. Trent's prize was a water bottle and a baseball cap. The ~31-mile short course ride was on a combination of asphalt, gravel, hard-packed dirt, and one mile of single-track soft dirt and sand in the middle of the ride. It was 40 degrees and sunny, and the ride was beautiful with rolling fields, horses that ran alongside our bikes on the other side of a fence, and a stunning view of a frosty snow capped mountain in the distance. Photo by Ryan Muncy Photography; from the Old Man Winter Rally website. Since last year’s Castell Grind, where I fell multiple times in soft, wet sand, rode off course and got lost, I’ve been over-cautious on my gravel bike and I’m still afraid of wet, muddy conditions. To prepare for this event, we attended a clinic last week in Boulder in which we rode part of the course, including the single-track section. Last weekend it was muddy and I rode around the one-mile loop feeling scared, but staying upright. I spent the week hoping the nice warm weather would hold out, and I got lucky. It was supposed to rain and snow the night before the race, but it didn’t! Dry, perfect conditions for the short course ride, and I could not have been happier. I gained quite a bit of confidence on my bike this weekend. On my last few outdoor rides, including the clinic, I have felt great for the first hour or so, and then bonked badly. The problem was poor fueling – with thick gloves on, it’s hard to get to bars and other snacks in a jacket pocket, so I opted not to eat anything. It’s easier to get a bottle out to drink, but my bottles just had Gatorade and water, and that was not enough. I’d get dehydrated too, because when it’s cold, you don’t think to drink. But actually, you should drink more than normal at altitude to avoid dehydration. Back to the old standby, Infinit! My order came in just in time for the race; I filled two bottles with 250 wonderful grape-flavored calories each, and forced myself to drink both of them during the ride. It was PERFECT. I felt like my old self, and stayed strong throughout the 2-hour ride. At one point in the last 3 miles, I looked back and saw that I was pulling a string of 10 riders behind me. I felt so strong and happy. The post-race party in a cute little park in Lyons was great, with delicious beer and chili as promised, wonderful warming coffee and Clif products, and a cool awards presentation where the podium folks sprayed beer rather than champagne. We ended up walking over to Oskar Blues afterward to get some food (and more beer), and then headed home by way of Voodoo Donuts (yes, these donuts have officially become a problem). It felt really good to race again! I’m motivated in a way that I haven’t been for a while. Just seeing the caliber of athletes around us and the strength it will take to try to keep up with them gives me mental fuel for those solo weekday trainer rides. I’m looking forward to the season! Hopefully Old Man Winter doesn’t get in the way too much. Fun with friends Whiting and Ariana at the post-race party.